While on our 2015 Terror Dave road trip, we visited many things and had many discussions. On April 3rd we headed to one of the world’s largest bats in Louisville, KY (and I am not talking about the 120 foot baseball bat that stands outside of the Louisville Slugger Museum). Those that know us are aware of the fact that sports rate very low on our list of priorities so that when the Daves go to see the world’s largest bat, you can bet it is either something zoological or something scary. Driving to the location we had no idea what to expect but knew what to look for; a large vampire bat on the side of a building. 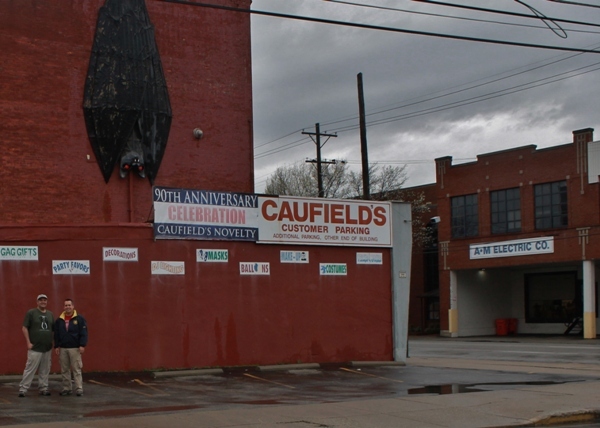 We found it with ease but never guessed that this façade was actually mounted onto the side of one of the nation’s oldest remaining magic and novelty stores, Caufield’s Novelty! The funniest thing about this was that I had just been discussing trick shops with the other Dave during this trip and how scarce they were and that I’d just become part of a Facebook group dedicated to them. 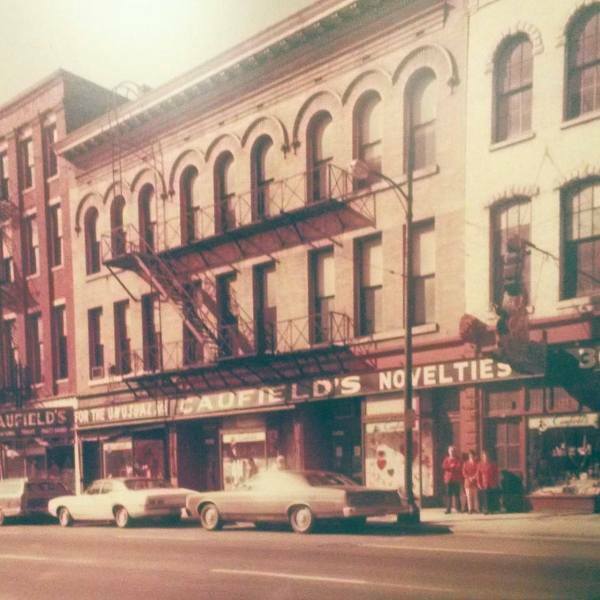 Caufield’s Novelties, as it originally looked. 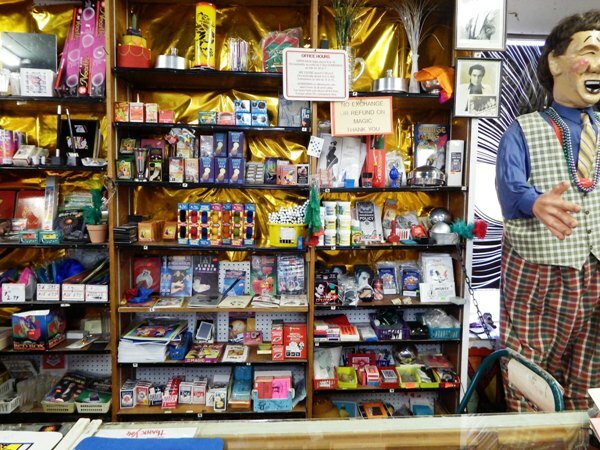 Growing up in Rhode Island, we never really had a “Magic and Novelty Shop” like other states did. 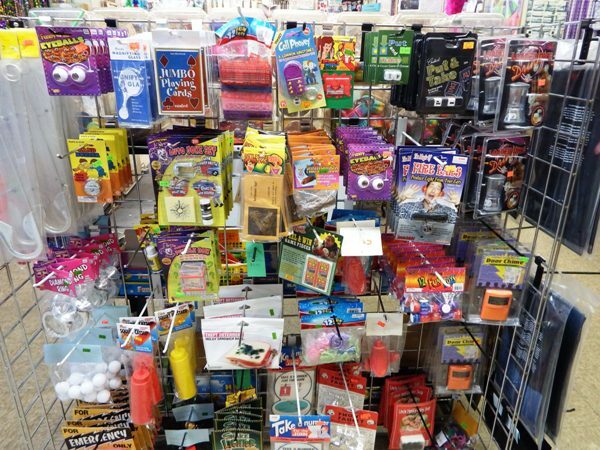 Of course we had Spencer’s Gifts and you could always order from the Johnson Smith Company catalog, but an actual honest to goodness magic and novelty store was not to be found in this area. 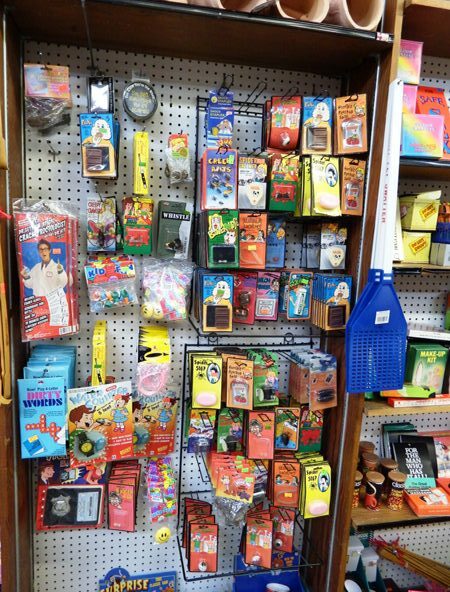 Smaller toy stores like KayBee Toys would usually feature spinner racks with cheaper and more common magic tricks and novelties, usually released by a company called Adams, a company that has been around since 1906 but that was about it. It wasn’t long before we realized that we were actually standing outside of one of these very types of stores, in fact one of the nation’s oldest with its roots starting in the 1920’s! Thankfully, despite it only being a little after 9 AM, the store was open and this is where we spent the next hour or so of our day, soaking in the jokes, the magic, the Halloween masks and the history. Stores like this are just magical to me, and not just because they sell magic tricks and illusions. This is what a fun store is all about. You can not help but look through the offerings and smile, either at the funny joke items or clever of a magic tricks. There’s so much stuff to look at, at times time’s it’s dizzying, and you never know where to look among the countless numbers of brightly-colored packages. 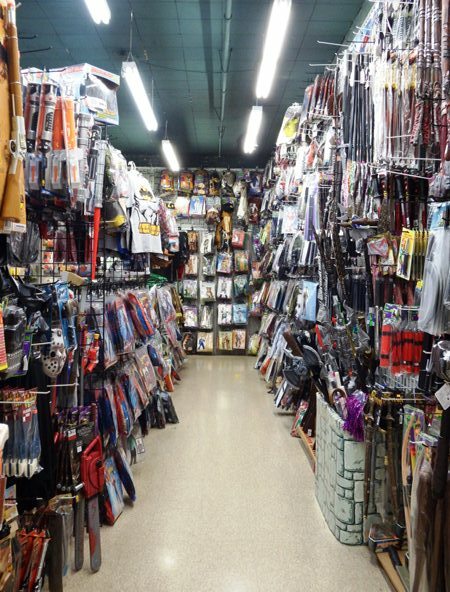 This store is deceptively large with many large rooms, each devoted to something else. 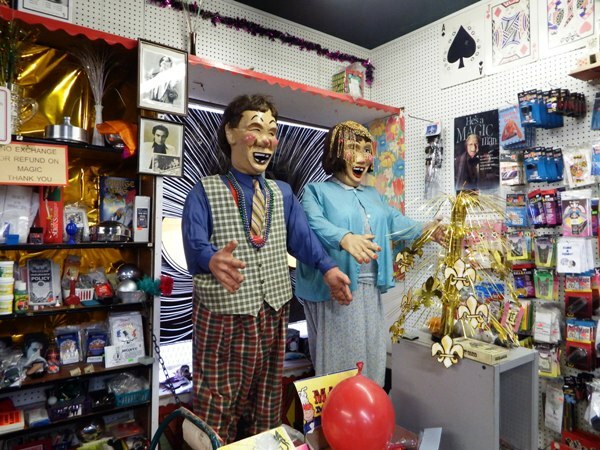 One room houses the magic tricks, novelties and lighting gear. 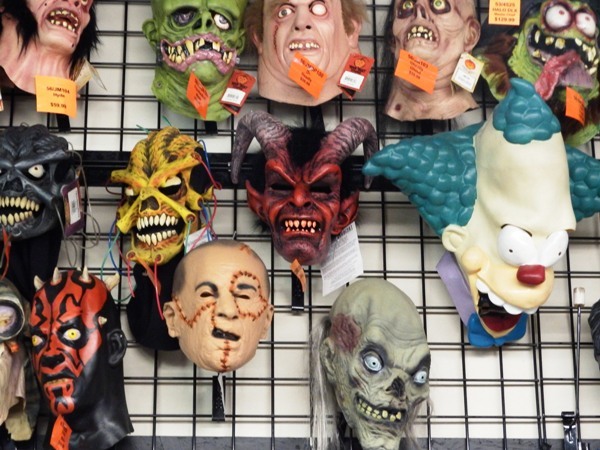 The main room features theatrical accessories like wigs, masks, makeup, gloves and glasses. Next is a room full of children’s costumes followed by a full room of adult costumes. From there you enter The Dungeon, a room devoted to full size Halloween props. Though I am a huge fan of Halloween and actually collect masks and props, I did find myself having the most fun in the first room with the magic and novelties. The staff at Caufields were all friendly and spent a lot of time talking to us. 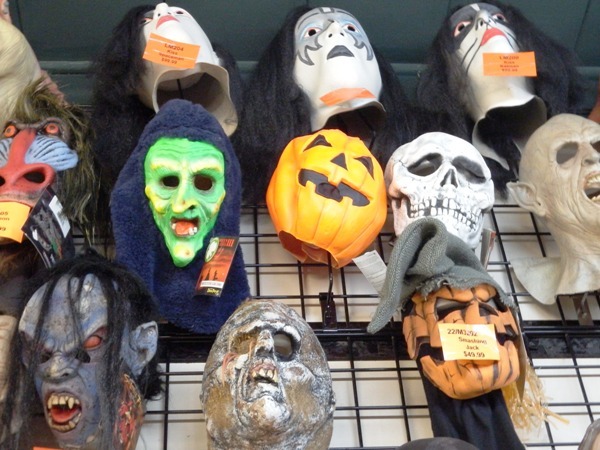 One gentleman in particular, Trevor, spent some time with me discussing Halloween masks, in particular those by the now defunct Don Post Studios. I have always been a fan of Don Post masks and Caufields carries quite a few of these classics, despite them going out of business in 2012. Of course I couldn’t leave without buying something and I had my eye on two masks in particular, both by Zagone Studios (formerly Be Something Studios). When I couldn’t decide on which of the two masks I liked better, Dave offered to buy one of them for me. This was such a nice and much appreciated treat! Diablo, the devil mask in the middle, is one of two masks I added to my collection. Satanic Panic, in the lower left corner, is the 2nd mask added to my collection. This particular side trip was such a neat surprise and for so many reasons. 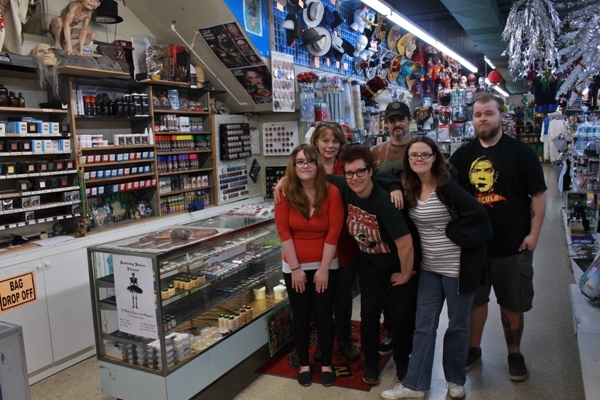 Not only did we get to visit such a rare store but also met a great bunch of people, all of whom made our visit that much better! If you’re in the Louisville, KY area I cannot recommend visiting this store enough! They can be found at 1006 West Main Street…just look for the giant vampire bat! Next up: an interview with Janine Caufield! This entry was posted in Terror Daves on the Road!, Weird USA and tagged Adams Magic, Be Something Studios, Caufield's Novelty, Don Post Studios, gag, gags, Giant Vampire Bat, HALLOWEEN, illusion, Janine Caufield, Johnson Smith Company, KayBee Toys, KY, Louisville, magic, novelties, Novelty, Spencer's Gifts, Zagone Studios. Bookmark the permalink. ← In the Grip of KING KONG & the Tourist Traps of Tennessee!